Remodel’s last album ‘Statues’ brought together the band and the Intentist movement in two ways. 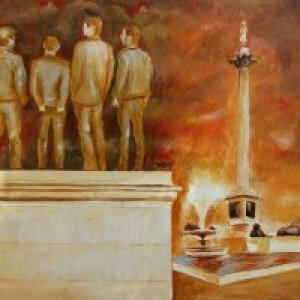 Firstly, Intentist Vittorio Pelosi was asked to design the cover (below) which depicts the members of the band as virtual statues on the fourth plinth on Trafalgar Square. Secondly, Remodel’s album launch in Hoxton was accompanied by an Intentist art exhibition.